Nowadays, when you first start up your computer, you are likely to be greeted with dozens of colorful icons on your desktop asking you to sign up for trial offers from the likes of America Online, Earthlink, Google, and other software makers. 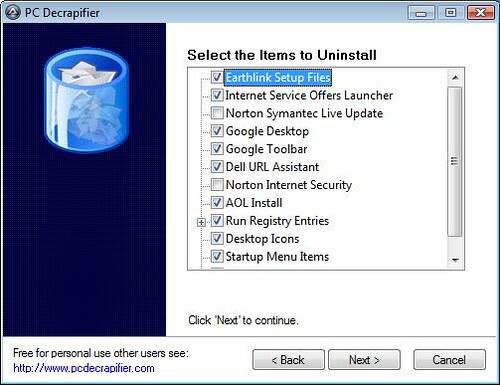 Sure, you can manually uninstall all of these junk programs, but why should you have to when a program called PC Decrapifier will do it for you. The free program gets its name from the fact that the junk software that comes pre-loaded on new computers are often referred to as "craplets". To get started clearing out these craplets, all you need to do is start PC Decrapifier, create a restore point (just in case you remove something that you shouldn't), and then select the programs that you want to remove. So free up some screen real estate by removing those MusicMatch, AOL, Norton, "Get High Speed Internet! ", and QuickBooks Trial icons from your desktop. PC Decrapifier works on both Windows XP and Vista.